Since 2005 the combination of below average March extents, combined with above average melts has produced September extents below 6 M Km2 each year. For the years 2007 to 2014 inclusive, each year MASIE shows higher maximums than NOAA, on average 5% higher. In each of those same years MASIE shows higher minimums than NOAA, on average 15% higher. The melt extent is more comparable: NOAA shows an average annual loss of 70.5 %, while MASIE shows an average loss of 67.5%. Climatologists say the NIC estimates are “conservative.” By this they mean NIC’s priority is shipping safety, and so, when in doubt, under mixed ice and water conditions, ice charts show ice. NIC people do not make predictions about sea ice, they only report what is there, according to their multiple sources. Note: NOAA has bureaucratic authority over NIC and advises against using NIC records for climate analysis. Last year, NIC results became available only on a rolling 30-day basis, so that estimates older than the current period are no longer available. Noticing this policy change, I began building a spreadsheet to capture the history for my own analysis. Since mid November, 2014, NIC ice extent reports have been unavailable at the MASIE webpage. Update on April 2: NSIDC now says MASIE will be back after April. Update November 2015: MASIE dataset is now available from January 1, 2006 to the present. There are several research centers that monitor Arctic ice extent, especially NSIDC (USA), DMI (Denmark), JAXA (Japan), and NANSEN (Norway). All start with the same data from passive microwave sensors on NASA satellites. Slight differences arise from different algorithms used to process the inputs into ice extent estimates. 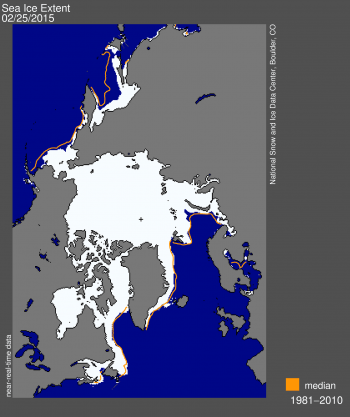 Operational ice charts are an alternative measure of Arctic sea ice extent. These are prepared daily by Canada, Russia and US maritime authorities to assist ships navigating in Arctic waters. For example, the US National Ice Center (NIC) provides an index called MASIE (Multisensor Analyzed Sea Ice Extent). NIC charts are based upon not only passive microwave numbers, but also satellite imagery and reports from planes and ships operating in the regions. Operational ice charts are the most detailed pre-satellite records, with the Russian archives being the oldest. Measuring anything in the Arctic is problematic due to the conditions. And any technology has limitations and uncertainties. Thus it is useful to have more than one estimate of ice extent. Comparisons of the two types of data show the passive microwave results underestimate ice extent, especially during the late summer minimum. The difficulty is mistaking surface melt water for open water, failing to discern the ice underneath. 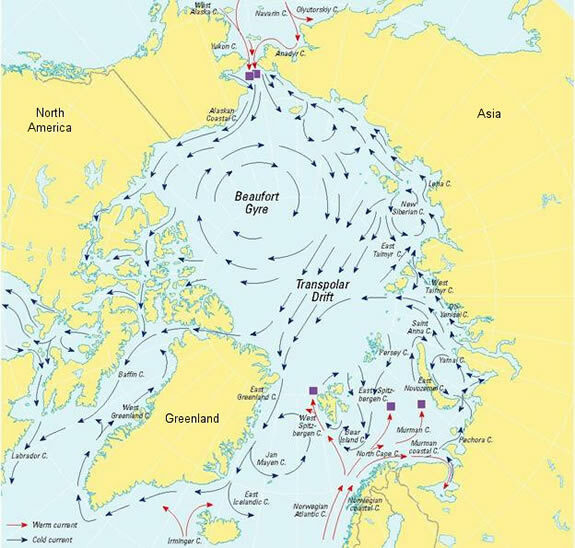 A warning note: The Russians are not alarmed by what they see in the Arctic. 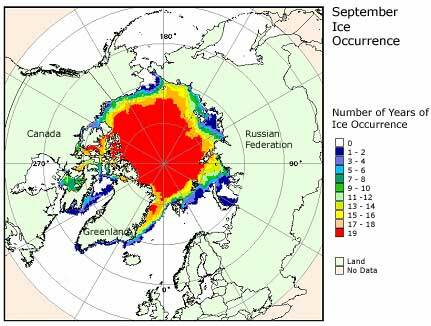 The extreme melting of ice in the summer 2012 is most likely the last gesture that the warming is ending. In fact, ice is a product of climate, and when comparing the graphs of the air temperature and melting ice, one can see that they coincide, Genrikh Alekseev said. Operational ice charts are more variable due to human error in their production. Climatologists prefer passive microwave indices of ice extent because they are consistently wrong. One wonders about their preference if satellites were overestimating ice. For myself I am glad for two mostly independent measures, one done by people who only want to get it right that day. Note: As of March 2015, NSIDC has been showing MASIE off-line since mid November 2014. They say NIC results will be back in April. Alarmists are always claiming the Arctic Sea Ice is the “canary in the coal mine.” Wrong. 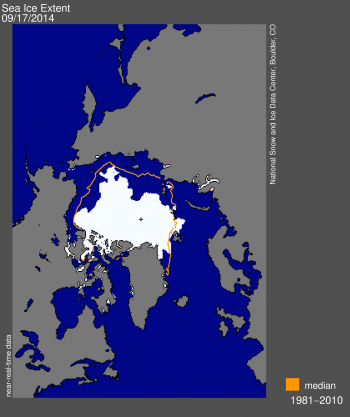 Arctic ice extent varies a lot for a lot of reasons. Predictions of its disappearing because of rising CO2 are another attempt to use a natural process as proof that global warming is dangerous and linked to fossil fuel emissions. First some historical context for how NH ice extent varies over decades and centuries. The references below, among many others, show that the factors causing Arctic Ice to lessen, when that was happening, have nothing to do with air temperatures which is the only way CO2 could have an effect (theoretically). The melting is much more the result of water circulations, especially when warm Atlantic water from the south is able, or not, to get into the Arctic Ocean. In addition to water circulation effects, sea ice extent is influenced by clouds and winds. Like most things in the climate, Arctic sea ice extent is determined by many interacting factors. Among those many influences, the weakest case is claiming CO2 as a driving force. Analyzing temperature change is in fact much simpler and avoids data manipulations like anomalies, averaging, gridding, adjusting and homogenizing. Temperature Trend Analysis starts with recognizing that each micro-climate is distinct with its unique climate patterns. So you work on the raw, unadjusted station data produced, validated and submitted by local meteorologists. This is accessed in the HADCRUT3 dataset made public in July 2011. Of course, there are missing datapoints which cause much work for climatologists. Those are not a big deal for trend analysis. I am not the first one to think of this. Richard Wakefield did similar analyses in Ontario years ago, and Lubos Motl did trend analysis on the entire HADCRUT3 in July 2011. With this simplifying concept and a template, it is possible for anyone with modest spreadsheet skills and a notebook computer to answer how area temperatures are trending. I don’t claim this analysis is better than those done with multimillion dollar computers, but it does serve as a “sanity check” against exaggerated claims and hype. The method involves creating for each station a spreadsheet that calculates a trend for each month for all of the years recorded. Then the monthly trends are averaged together for a lifetime trend for that station. To be comparable to others, the station trend is presented as degrees per 100 years. A summary sheet collects all the trends from all the sheets to provide trend analysis for the geographical area of interest. Temperature change depends on your location and time of the year. The rate of warming here is not extreme and if the next 100 years is something like the last 100, in Kansas there will likely be less than a degree C added. When you look behind the summary page at BEST, it reports that the Kansas warming trend since 1910 is 0.75°C +/-0.08, close to what my analysis showed. So the alarming number at the top was not the accumulated rise in temperatures, it was the Rate for a century projected from 1960. The actual observed century rate is far less disturbing. And the variability across the state is considerable and is much more evident in the trend analysis. I had wanted to use raw data from BEST in this study, because some stations showed longer records there, but for comparable years, the numbers didn’t match with HADCRUT3. Not only does this approach maintain the integrity of the historical record, it also facilitates what policy makers desperately need: climate outlooks based on observations for specific jurisdictions. Since the analysis is bottom-up, micro-climate trends can be compiled together for any desired scope: municipal, district, region, province, nation, continent. This example analyzed monthly average temperatures at a set of stations. This study used HADCRUT3, but others are done with CRUTEM4 and GHCN. The same technique can be applied to temperature minimums and maximums, or to adjusted and unadjusted records. And since climate is more than temperatures, one could also study precipitation histories, or indeed any weather measure captured in a time series. The trend analysis workbook is provided below. It was the first iteration and the workbook was refined and enhanced in subsequent studies, also posted at this blog. This article was first posted on July 28, 2014 at Watts Up With That. This is a study to see what the world’s best stations (a subset of all stations I selected as “world class” by criteria) are telling us about climate change over the long term. There are three principle findings. To be included, a station needed at least 200 years of continuous records up to the present. Geographical location was not a criterion for selection, only the quality and length of the histories. 247 years is the average length of service in this dataset extracted from CRUTEM4. The 25 stations that qualified are located in Russia, Norway, Denmark, Sweden, Netherlands, Germany, Austria, Italy, England, Poland, Hungary, Lithuania, Switzerland, France and Czech Republic. I am indebted to Richard Mallett for his work to identify the best station histories, to gather and format the data from CRUTEM4. The Central England Temperature (CET) series is included here from 1772, the onset of daily observations with more precise instruments. Those who have asserted that CET is a proxy for Northern Hemisphere temperatures will have some support in this analysis: CET at 0.38°C/Century nearly matches the central tendency of the group of stations. The average station shows an accumulated rise of about 1°C over the last centuries. The large deviation, and the fact that at least one station has almost no warming over the centuries, shows that warming has not been extreme, and varies considerably from place to place. 2. The warming is occurring mostly in the coldest months. The average station reports that the coldest months, October through April are all warming at 0.3C or more, while the hottest months are warming at 0.2C or less. In fact, the months of May through September warmed at an average rate of 0.17C/Century, while October through April increased at an average rate of 0.58C/Century, more than 3 times higher. This suggests that the climate is not getting hotter, it has become less cold. That is, the pattern suggests milder winters, earlier springs and later autumns, rather than hotter summers. 3. An increase in warming is observed since 1950. 3.1950 as the date from which it is claimed that CO2 emissions begin to cause higher temperatures. From 1850 to the present, we see an average upward rate of almost a degree, 0.95°C/Century, or an observed rise of 1.53°C up to 2011. Contrary to conventional wisdom, the aftereffects of the LIA lingered on until 1900. The average rate since 1950 is 2.6°C/Century, higher than the natural rate of 1.5°C in the preceding 50 years. Of course, this analysis cannot identify the causes of the 1.1°C added to the rate since 1950. However it is useful to see the scale of warming that might be attributable to CO2, among other factors. Of course climate is much more than surface temperatures, but the media are full of stories about global warming, hottest decade in history, etc. So people do wonder: “Are present temperatures unusual, and should we be worried?” In other words, “Is it weather or a changing climate?” The answer in the place where you live depends on knowing your climate, that is the long-term weather trends. Note: These trends were calculated directly from the temperature records without applying any adjustments, anomalies or homogenizing. The principle is: To understand temperature change, analyze the changes, not the temperatures. Along with this post I provide below the World Class TTA workbook for readers to download for their own use and to check the data and calculations. Energy and Poverty are obviously tied together. “Access to cleaner and affordable energy options is essential for improving the livelihoods of the poor in developing countries. The link between energy and poverty is demonstrated by the fact that the poor in developing countries constitute the bulk of an estimated 2.7 billion people relying on traditional biomass for cooking and the overwhelming majority of the 1.4 billion without access to grid electricity. Most of the people still reliant on traditional biomass live in Africa and South Asia. The moral of this is very clear. Where energy is scarce and expensive, people’s labor is cheap and they live in poverty. Where energy is reliable and cheap, people are paid well to workl and they have a better life. In December 2014, Willis Eschenbach posted GMT series generated by 42 CMIP5 models, along with HADCRUT4 series, all obtained from KNMI. The dataset includes a single run showing GMT from each of 42 CMIP5 models. Each model estimates monthly global mean temperatures in degrees Kelvin backwards to 1861 and forwards to 2101, a period of 240 years. The dataset from CMIP5 models includes 145 years of history to 2005, and 95 years of projections from 2006 onward. The estimated global mean temperatures are considered to be an emergent property generated by the model. Thus it is of interest to compare them to measured surface temperatures. The models produce variability year over year, and on decadal and centennial scales. These models can be thought of as 42 “proxies” for global mean temperature change. Without knowing what parameters and assumptions were used in each case, we can still make observations about the models’ behavior, without assuming that any model is typical of the actual climate. Also the central tendency tells us something about the set of models, without necessarily being descriptive of the real world. What temperatures are projected by the average model? The rates in the table are C/decade. Over the entire 240 years time series, the average model has a warming trend of 1.26C per century. This compares to UAH global trend of 1.38C, measured by satellites since 1979. Is one model better than the others? I identified the models that produced an historical trend nearly 0.5K/century over the 145 year period, and those whose trend from 1861 to 2014 was in the same range. Then I looked to see which of the subset could match the UAH trend 1979 to 2014. Out of these comparisons the best performance was Series 31, which Willis confirms is output from the INMCM4 model. Rates in the table below are C/decade. Note that this model closely matches HADCrut4 over 60 year periods, but shows variances over 30 year periods. That is, shorter periods of warming in HADCrut4 run less warm in the model, and shorter periods of cooling in HADCrut4 run flat or slightly warming in the model. Over 60 years the differences offset. In contrast with Series 31, the other 41 models typically match the historical warming rate of 0.05C by accelerating warming from 1976 onward and projecting it into the future. For example, while UAH shows warming of 0.14/decade from 1979-2014, CMIP5 models estimates average 0.215/decade, ranging from 0.088 to 0.324/decade. For the next future climate period, 2006-2035, CMIP5 models project an average warming of 0.28C/decade, ranging from 0.097 to 0.375/decade. What’s different about the best model? Above, I showed how one CMIP5 model produced historical temperature trends closely comparable to HADCRUT4. That same model, INMCM4, was also closest to Berkeley Earth and RSS series. Curious about what makes this model different from the others, I consulted several comparative surveys of CMIP5 models. There appear to be 3 features of INMCM4 that differentiate it from the others. 1.INMCM4 has the lowest CO2 forcing response at 4.1K for 4XCO2. That is 37% lower than multi-model mean. So the model that most closely reproduces the temperature history has high inertia from ocean heat capacities, low forcing from CO2 and less water for feedback. Why aren’t the other models built like this one? In the real world, temperatures go up and down. This is also true of HADCRUT4. 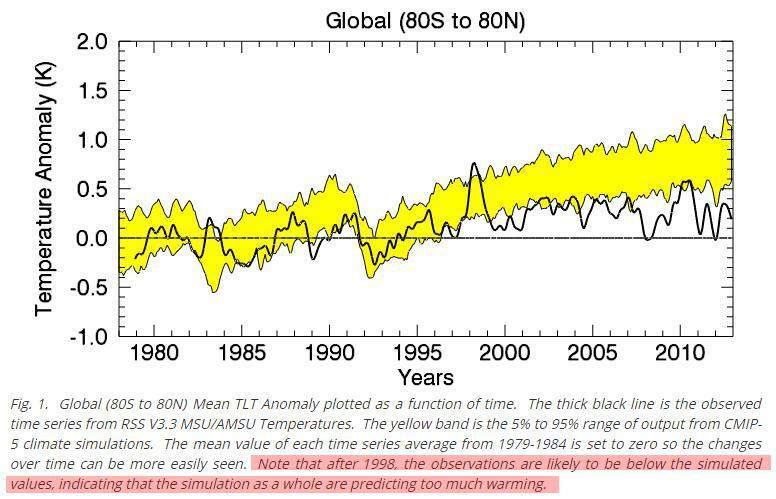 In the world of climate models, temperatures only go up. Some variation in rates of warming, but always warming, nonetheless. Not all models are created equal, and the ensemble average is far from reality and projects unreasonable rates of future warming. It would be much better to take the best model and build upon its success. “A recent experiment at the Lawrence Berkeley National Laboratory in California has directly measured the warming effect of our carbon emissions, using data from instruments that measure the infrared radiation being reflected back to the ground by the atmosphere – the so-called greenhouse effect. The media was agog over this paper, saying that it measures the warming effect of CO2 in the atmosphere, and is proof of the greenhouse gas effect. This paper claims to prove rising CO2 in the atmosphere increases down-welling infra-red radiation (DWIR), thereby warming the earth’s surface. The claim is based on observations from 2 sites, in Alaska and Oklahoma. Let’s examine the case made. Observation: In Alaska and Oklahoma CO2 and DWIR are both increasing. Claim: Additional CO2 is due to fossil fuel emissions. Claim: Higher DWIR is due to higher CO2 levels. Claim: Global DWIR is rising. Claim: Global surface temperatures are rising. There are several issues that undermine the report’s conclusion. Issue: What is the source of rising CO2? Response: Natural sources of CO2 overwhelm human sources. The sawtooth pattern of seasonal CO2 concentrations is consistent with release of CO2 from the oceans. Peaks are in March when SH oceans are warmest (60% of world oceans), and valleys are in September when NH oceans are warmest. In contrast biosphere activities peak in January in SH and July in NH. CO2 content of the oceans is 10 times that of the atmosphere, resulting in the sawtooth extremes. Human emissions are ~5 to 7 Gigatons compared to ~150 Gigatons from natural sources. Issue: What is the effect of H2O and CO2 on DWIR? Response: H2O provides 90% of IR activity in the atmosphere. The long term increase in DWIR can be explained by increasing cloudiness, deriving from evaporation when the sunlight heats the oceans. A slight change in H2O vapor overwhelms the effect of CO2 activity, and H2O varies greatly from place to place, while the global average is fairly constant. Issue: What is the global trend of DWIR? Response: According CERES satellites, DWIR has decreased globally since 2000, resulting in an increasing net IR loss upward from the surface. Globally, Earth’s surface has strongly strengthened its ability to cool radiatively from 2000 to 2014 (by about 1.5 W/m2 or ~1 W/m2 per decade) according to CERES. The increased upward heat loss from the surface is matched by decreasing trend of DWIR globally. And this is in spite of significantly increasing atmospheric content of both CO2 and H2O (WV & clouds) + allegedly rising temps since 2000. The rise in CO2 is almost all from natural sources, not fossil fuel emissions. IR activity is almost all from H2O, not from CO2. Global DWIR is lower this century, and the surface heat loss is less impeded than before. Global surface temperatures are not rising with rising fossil fuel emissions. In fact, you need only apply a little critical intelligence to this paper, and it falls like a house of cards. Are there no journalists with thinking caps allowed to write about this stuff?